Vajrayogini, is a representation of complete Buddhahood in female form, whose practices are associated with the Chakrasamvara Cycle of Anuttarayoga Tantra. She possesses supernatural powers and wisdom and has taught great Indian and Tibetian yogis. Vajrayogini appeared again and again to the Great Mahasiddha Naropa giving teachings. Naropa, after practicing these teachings attained perfect knowledge and wisdom. The practice of Vajrayogini is only for the very fortunate and if practiced correctly can lead to Buddhahood in this very lifetime. She is the secret practice of Manjunatha Lama Tsongkapa himself. This Naro Dakini, holds a vajra chopper in her right hand and a skull-cup upraised in the left. Resting in the crook of her left elbow is a khatvanga staff. Naked and adorned with a tiara of five human skulls, she wears a necklace of fifty dry skulls and is standing with her two feet placed on the bodies of her own emanations – the deities Kalarati and Bhairava. These are not actual beings but emanated from her qualities and they represent contaminated desire, hatred and ignorance. Her trampling on them symbolizes by her practice we are able to destroy those negative qualities within us and transform ourselves into qualities that benefit others. On a outer level, her trampling them represents she is able to control and pacify outer obstacles such as accidents, sudden death, negative forces, demons/spirits, and purify the results of our negative actions of the past. She looks up to the pure realm of Kechara and drinks from the skull-cup held aloft in her left hand. Her looking upwards represents her great capacity that in this life she is able to help us create the circumstances for us to be taken to Kechara Paradise, her divine realm, where even the word suffering does not exist. She is supremely excellent in many facets of pacification of problems in this life. Increase of merits, wealth, attainments, and general harmony. Her glorious red body is symbolic of her ability to control our mind that creates unhappiness knowingly and unknowingly. She in her completeness also skillfully benefits practitioners through wrath. When all else fails, she uses wrathful means to subdue inner and outer creations to facilitate all that is necessary to pacify chronic negative results of previous karmic actions. 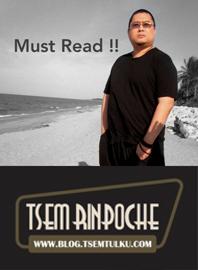 There are many prerequisites which must be completed before anyone can enter this practice including the compulsory initiation from a qualified Vajrayana Lama. The practice starts with Refuge in the Three Jewels, Guru Devotion, and knowing all the Three Principle Aspects of the path within the three scopes. Then the fortunate one must receive the tantric initiation of the mandala of either Chakrasamvara, Guhyasamaja or Vajrabhaivara. After meeting these requirements the practitioner is qualified to enter the Mandala of Vajrayogini. Buddhahood is then attainable within this very lifetime. In Buddhism, Female energy holds a very high position and there is no greater love than that which is represented by mothers, who give swiftly and unconditionally whatever we need. Thus if we listen to our Lama (who represents our mothers), practice Vajrayogini teachings, we receive the love of mothers and supported by her ability to grant us wisdom, we are able to achieve freedom from Samsara within one lifetime. 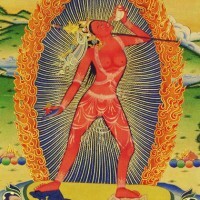 It is highly beneficial for those initiated and not initiated to make a connection with this extremely potent Vajrayogini Buddha whose blessings become more and more powerful as times degenerate. We can have images of her in the form of statues, carvings, tsatsas, paintings, pictures, and pendants. It is helpful for us to see, think and be exposed to her. Each exposure plants seeds of enlightenment in our mindstream. Her image pacifies our room or home, clears negative energy and protects from negative interferences. Feng shui that may not be correct in our home, can be corrected by placing a holy image of her. The larger the image, the better, as we will want to make offerings onto her holy body. Those who have the great fortune to come upon her, be fascinated and even read about her make a connection or even reconnect with her. Her practice is highly recommended as it is efficient, condensed, ’simple’ yet complete and for easily distracted people who ‘profess’ a lack of time, she is perfect. With perfect motivation, understanding of her profound qualities, clean samaya with our spiritual mentors, and faith in Vajrayogini we are entering into the doorsteps of a vajra palace that leaves inner, outer and secret pains behind. Praise to Vajrayogini who leads us to Kechara Paradise.